Should the NMC extend the range of OH nurses who qualify to be mentors in order to safeguard the future of the profession? NMC standards require that only occupational health nurses on part three of the NMC register can qualify as mentors for recently qualified practitioners. Sarah Van Zoelen argues for a change of the rules to safeguard the future of the profession. Two of the eight domains in the Nursing and Midwifery Council (NMC) standards to support learning and assessment in practice look at “evidence-based practice” and “context of practice”. Both emphasise the need to “initiate and respond to practice developments” and “contribute to strategies to increase or review the evidence base used to support practice”. Much of the occupational health role sees practitioners working alone in organisations. The NMC and Royal College of Nursing (RCN) state that mentors for OH practitioners who are specialist nurses have to be experts to be on part three of the NMC register. It could be argued that this restricts mentorship opportunities and practice for OH. In OH, the introduction of a new benchmarking and accreditation scheme – Safe, Effective, Quality Occupational Health Services (SEQOHS) – has led to the develop­ment of OH nurse competencies by the RCN (RCN, 2011). These competencies are mapped closely with the knowledge and skills framework, and clearly define the differences between a competent, experienced and expert nurse. The term mentorship is featured under the heading of “expert” only, which differs from mentorship in post-registration nursing, where after being qualified for 12 months, a nurse is able to become a mentor. In order to become an expert OH nurse, you need to have five years or more OH experience and hold a specialist qualification recognised by the NMC. This framework for development is a useful tool in assessing competence, however there are significant inconsistencies with other NMC guidance. I hold an MSc qualification in occupational health that is currently not recognised by the NMC and therefore I am not on part three of the register. I also hold the level seven mentorship module, which is not recognised by part three of the register for OH either. This ultimately means that although I fulfil all other aspects of the “expert” nurse, I cannot mentor a specialist OH nurse. I am not alone in holding specialist qualifications that are held in high esteem by the private sector but disregarded in the public sector. It can be argued that these objectives are ignored by the current models for mentorship within the OH specialism. Nationally, there is a shortage of OH nurses, which impacts the responsiveness to service needs (Harriss S and Harriss A, 2012), and, by not recognising the specialist courses that nurses in the profession are accessing, along with mentoring opportunities, this limits participation rather than widening it. The “Willis report” in 2012 supported the Kings Fund objectives, emphasising that nursing educational programmes should be “better evaluated” and that we should “develop a strategic understanding of the nursing workforce”. This is particularly relevant for OH. Jane Cummins, chief nursing officer for the NHS, developed the “6c’s” change model for health. In relation to OH, there needs to be clear communication between the NMC, education facilities offering non-accredited courses and prospective students to reassess competency issues in specialist practitioners. This would also embrace the courage aspect and bring the divide between private and public sectors closer, thus allowing more opportunity and support for learners and practitioners. This would also fulfil the commitment aspect allowing transparency of service and accountability in the delivery of improved healthcare (Cummins, 2012). The Council for Work and Health has recognised that at a time when the purpose and value of OH is being recognised, there is a significant lack of specialist practitioners to support the specialism. There are fewer physician training posts and funding of current training posts is unsustainable. If the NMC and RCN were to expand their focus to include a wider spectrum of courses and experienced practitioners, this in turn would allow for greater recognition, and a higher number of practice teachers and mentors within the workplace. A wider population of professionals would also lead to a greater research base, allowing for an increase of professionals supporting the vast numbers of the UK’s working population that currently have limited or non-existent OH support. Harrison (2014) argues that mainstreaming is now key to the future of OH, and with the introduction of a working group by the Council for Work and Health, change may be on the horizon. Our regulatory bodies have to fully understand the needs of the specialism in order to support the streamlining of standards of care, expectations of practitioners and customers, in order to safeguard the future of the profession. Cummings J (2013). Nursing Midwives And Care Staff – Join Our 6cs-Live Week Of Action [accessed 7 October 2013]. Harriss S, Harriss A (2012). “Leading By Example”. 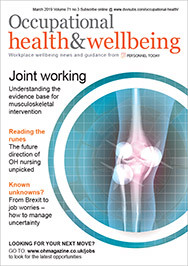 Occupational Health, Feb 2012, vol.64, no.2, pp.16-18. Harrison J (2014). “Planning the future: Delivering a vision for Occupational health and its workforce for the UK for the next 5-20 years”. Nursing Midwifery Council (2008). “Standards to Support Learning and Assessment In Practice”, (2nd edition), NMC. London. Royal College of Nursing (2011). “Occupational Health Nursing: Career and Competence Development”. RCN Guidance. “SEQOHS Safe, Effective, Quality Occupational Health Service 2015”. Faculty of Occupational Medicine. The Kings Fund (2011). Consultation Response: Liberating the NHS: Regulating Healthcare Providers, 31 March 2011. Sarah van Zoelen is lead occupational health adviser at People Asset Management.